Hello again EXO-Ls! 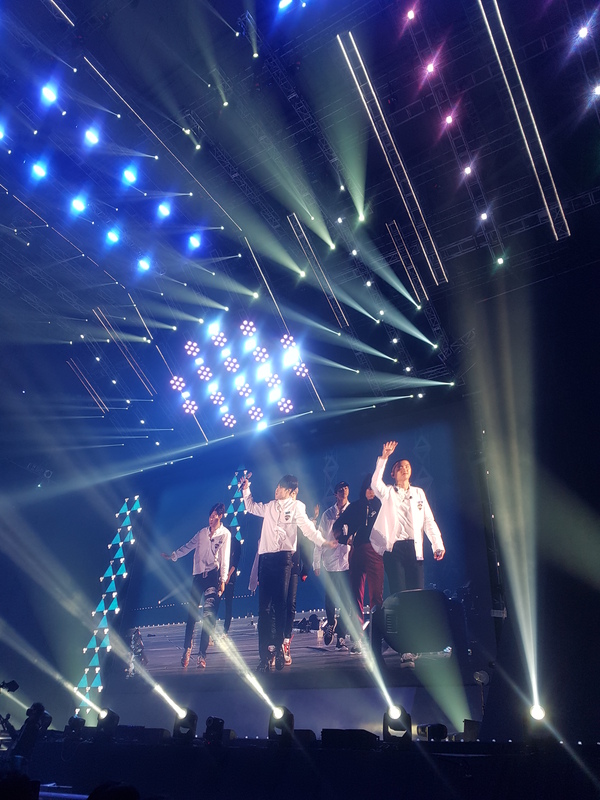 This is my account of the opening night of the boys’ 4th concert world tour – confusingly named (what does it mean?! Oh, Suho said it means paradise) the ElyXiOn. As the world tour kicked off in Korea, naturally I signed up for a Global Package with SMTOWN Travel yet again. Thinking about taking up a Global Package? 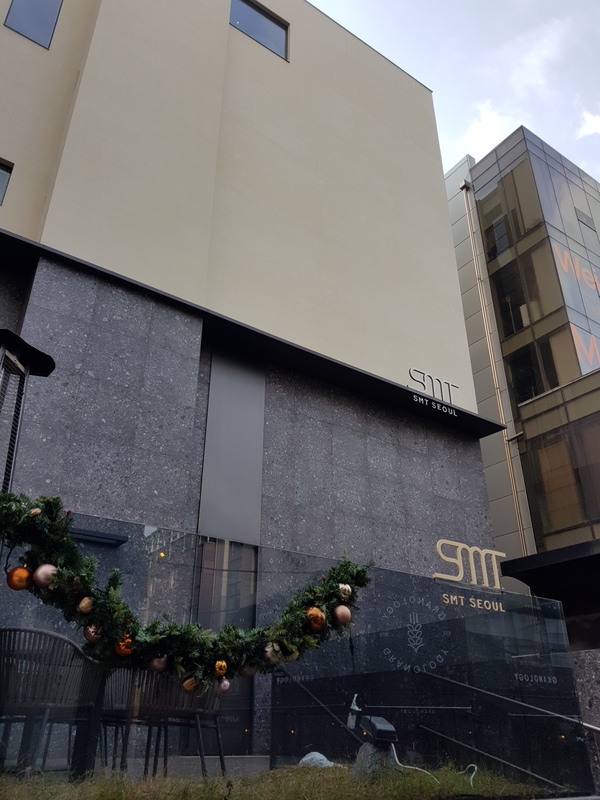 Check out my Fan Guide to SMTOWN Travel’s Global Package here! This time around I decided to live a little – even though I was only attending the opening night of the concert, I treated myself to the motherlode – the Premium package!!! Having heard the rumours of the Premium package but not being able to find many detailed write-ups on the Internet really piqued my curiosity so I took the plunge and went for it (after all, I don’t know how many more years I have in my fandom life, being *cough* a veritable noona to the boys and all that jazz). Was it worth it? Keep on reading to find out. What’s different between the Premium and Economy Packages? Well for starters, your hotel. 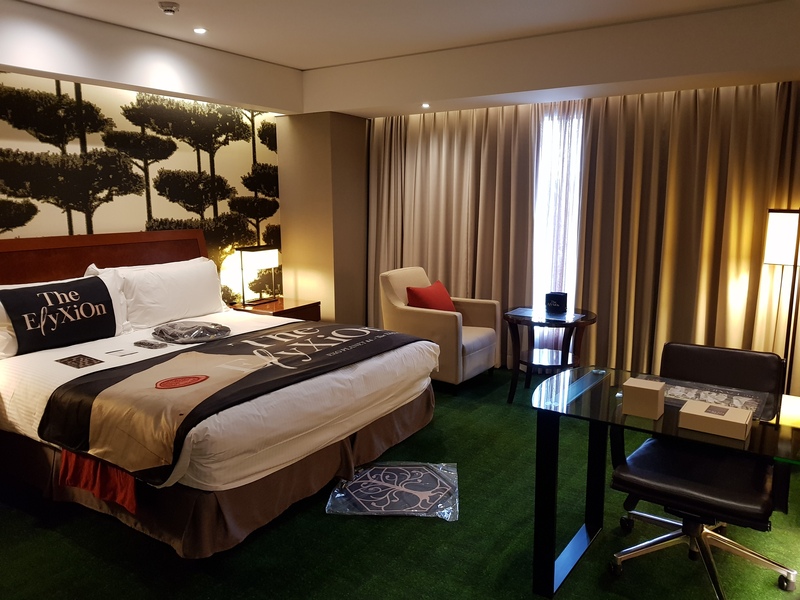 I was quite happy with Hotel Peyto Gangnam (Economy package) previously but when you’re on a Premium package, you get put up in a 5 star hotel. 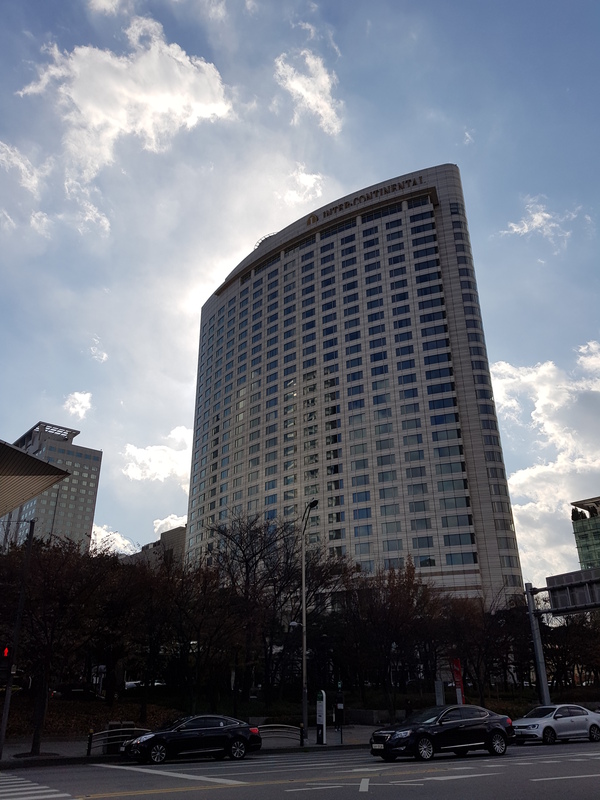 Say hello to the InterContinental Seoul COEX! Then there’s the hotel room. 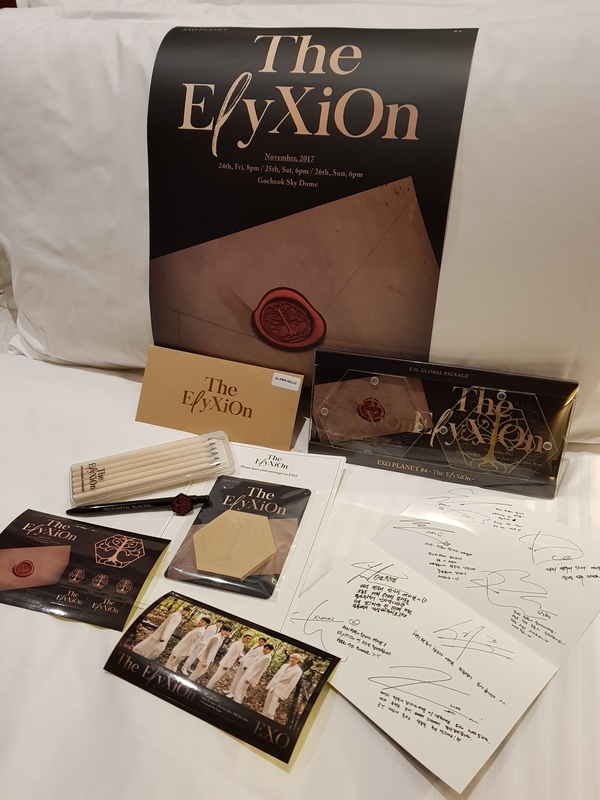 Premium package participants get what SMTOWN Travel calls the EXO theme room and it’s pretty evident why from the pictures. 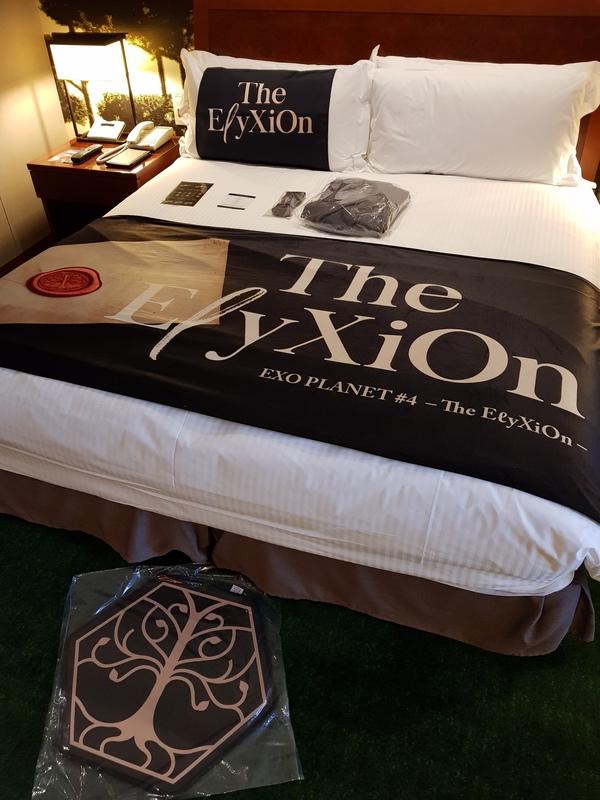 All of the EXO themed/branded goodies in the room are exclusively for Premium package participants to bring home so remember to bring a bigger suitcase! 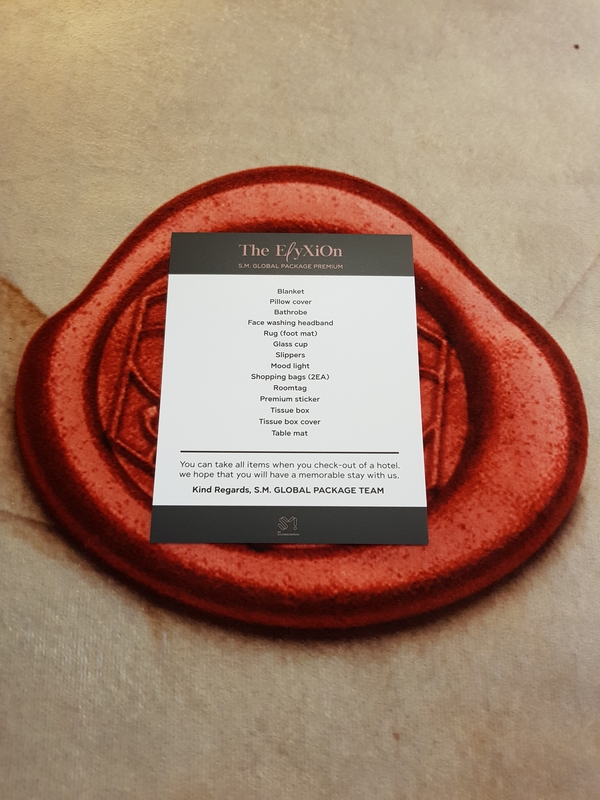 Now, the room and additional souvenirs are really decent (marketing on point I must say) and all that, but for me the Premium package perk I was really looking forward to was the mysteriously named Event 1 and Event 2. A search on Google and Instagram dug up the information that there could be either a backstage tour or a visit to EXO’s practice room. (Yes, the very same one that appears in the Infinite Challenge episode where Yoo Jaesuk learns the choreography for Dancing King!) My childhood dream was to be a ballet dancer and I love dance and performing on stage so this was THE ultimate event for me – to be able to see where hours are spent practicing and perfecting the performances you eventually see on stage. Are you excited yet? That’s just the summary! 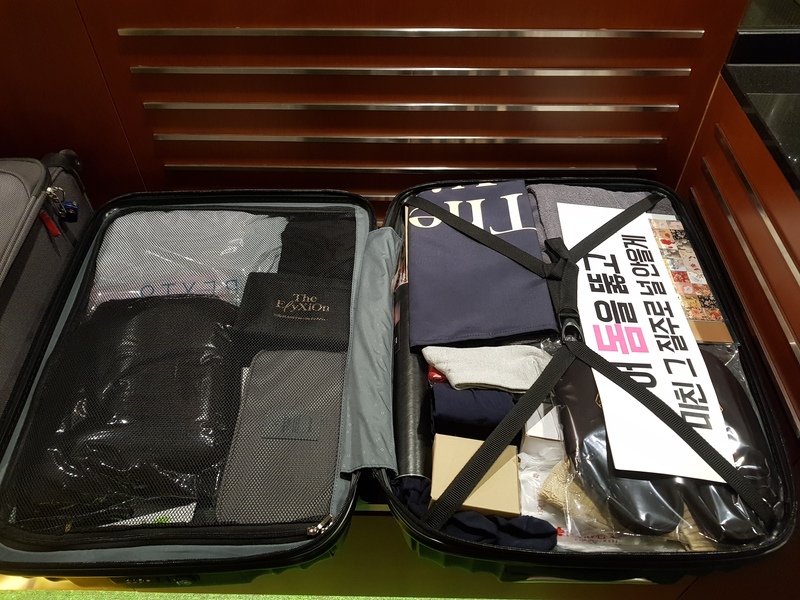 So when SMTOWN Travel calls a package a Premium Package, they really do mean it. And they flood you with all sorts of EXO themed merchandise from the very beginning to make sure you have a full on experience. 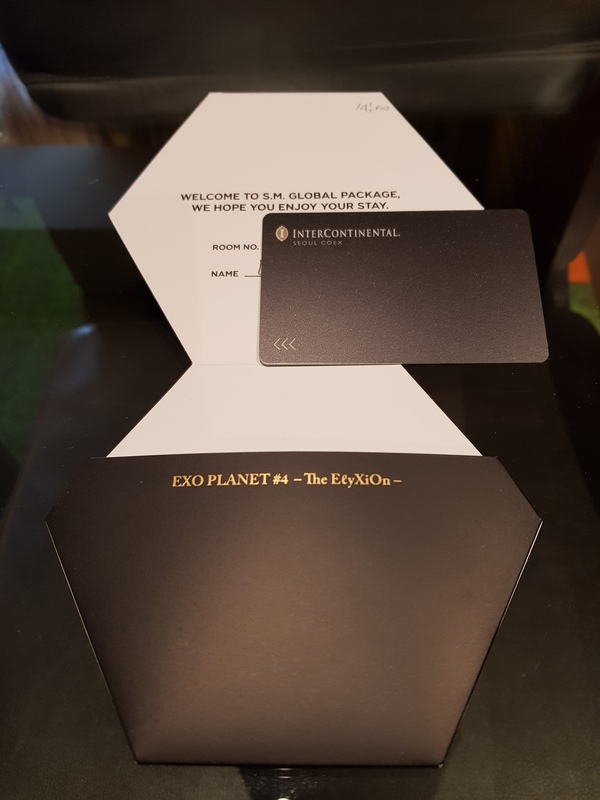 For the ElyXiOn, your EXO PLANET experience starts at the front desk of the hotel as soon as you receive your room key card in a special holder branded with the concert name. 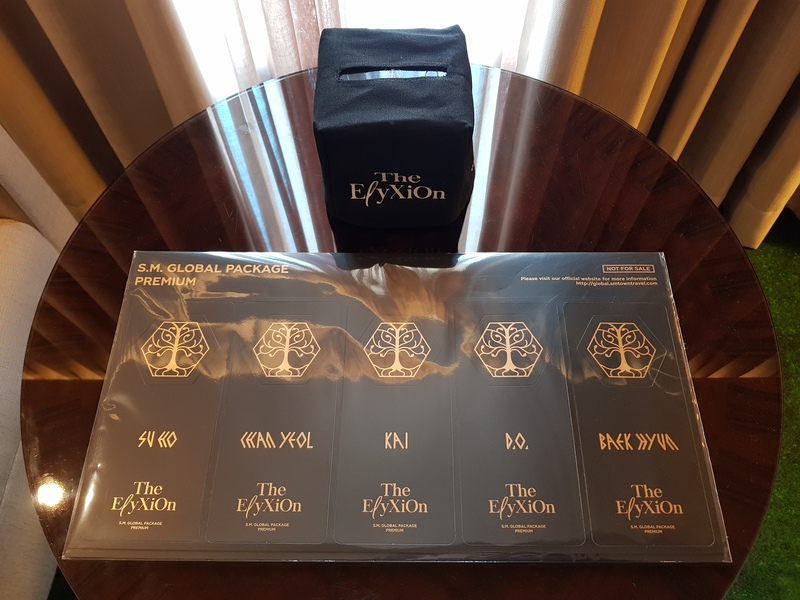 I really liked how the InterContinental’s room key card perfectly matched the matte black and gold design for the ElyXiOn. I wonder if it would be too much to ask for in the future if we could have special room key cards that can be taken home by fans at check out time? When you step into the room, the first thing that greets you is a beautifully made up bed – concert themed blanket, pillow cover, bathrobe, headband, premium sticker sheet and floor rug. But wait, there’s more! 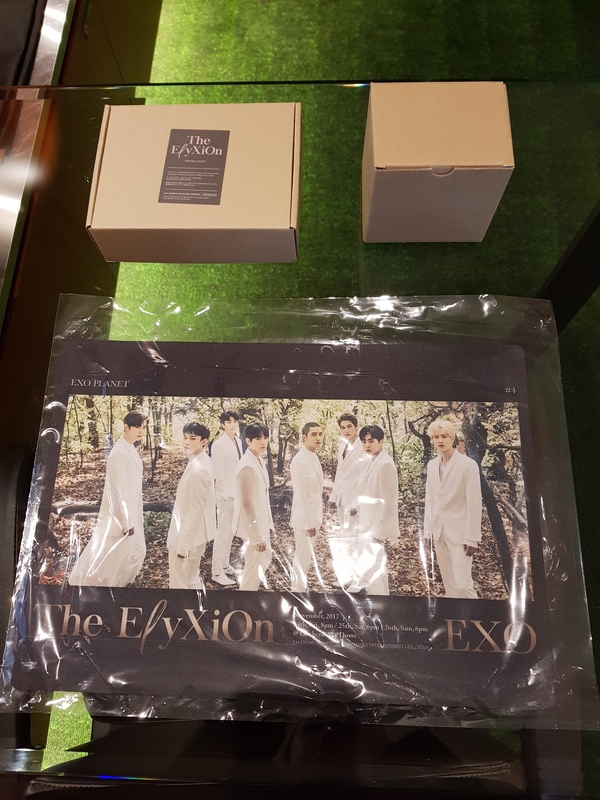 Reusable shopping bags and matching ElyXiOn logo bedroom slippers, ya know, to go with your embroidered bathrobe and headband. So you can totally rock the rich chaebol vibe. On the desk you’ll find a table placemat and in the boxes are a mood light and glass mug respectively. But that’s not the end yet! At the table by the window they’ve placed a tissue box with cover and a full set of room/door signs with each member. 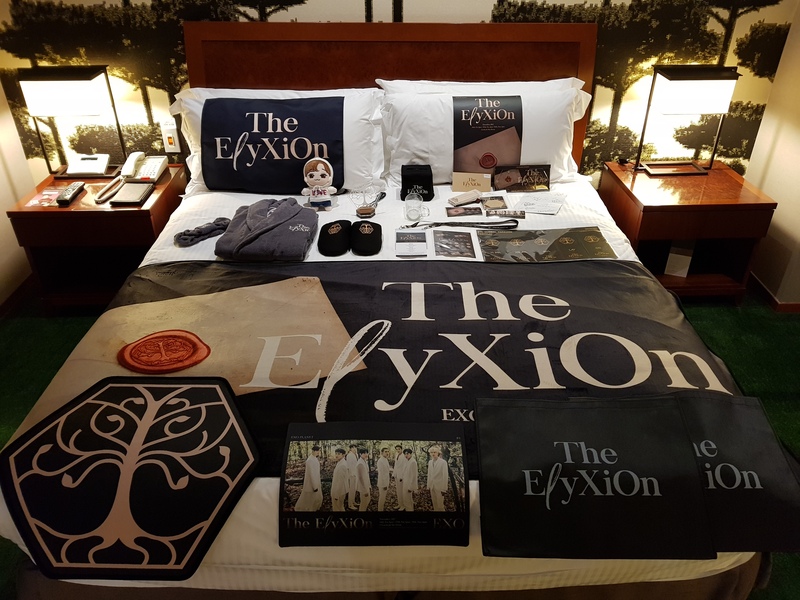 And to make sure you don’t forget to take all of your ElyXiOn branded merchandise, they’ve kindly provided a list of what you’re supposed to get under the Premium package. 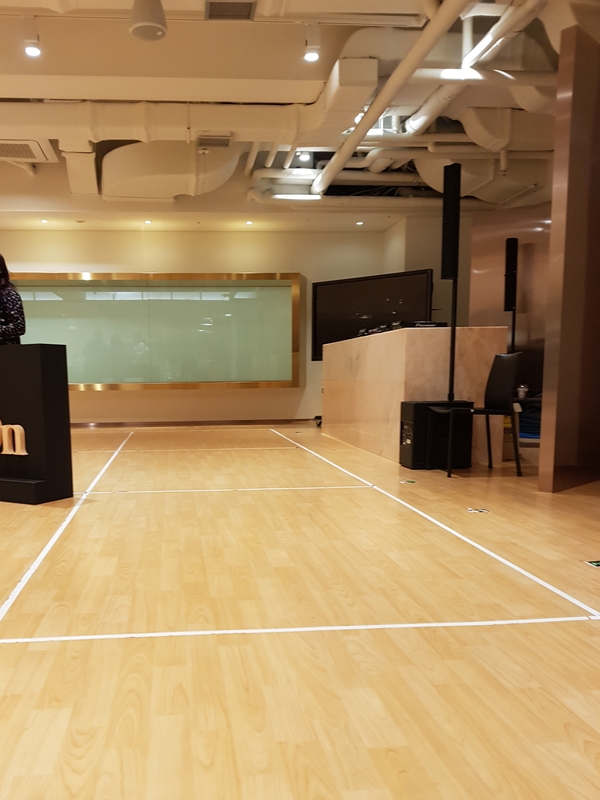 As usual, when you arrive and check into room, you’ll have to wait for the official tour desk to be opened to pick up your concert ticket, souvenirs and any merchandise purchased. 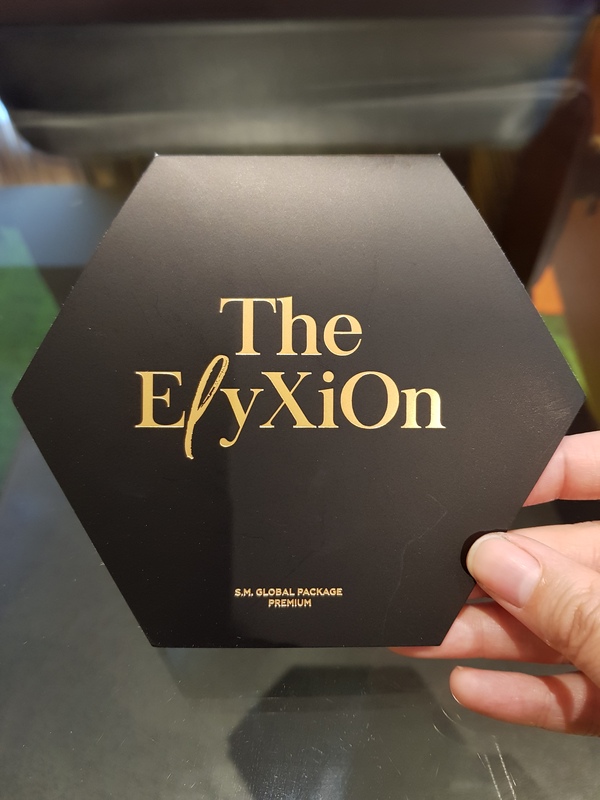 For the ElyXiOn, the main highlight of the standard tour souvenirs was the glass coaster set, which I thought really went well with the glass mug that Premium package participants got. For the first event we had a video screening of From Happiness at SMTOWN @ COEX Artium. This was the behind-the-scenes video and cuts from the shooting of EXO’s Dear Happiness photobook in Fiji. After the screening, you have about an hour to either head on down to the cafe or the merchandise store. 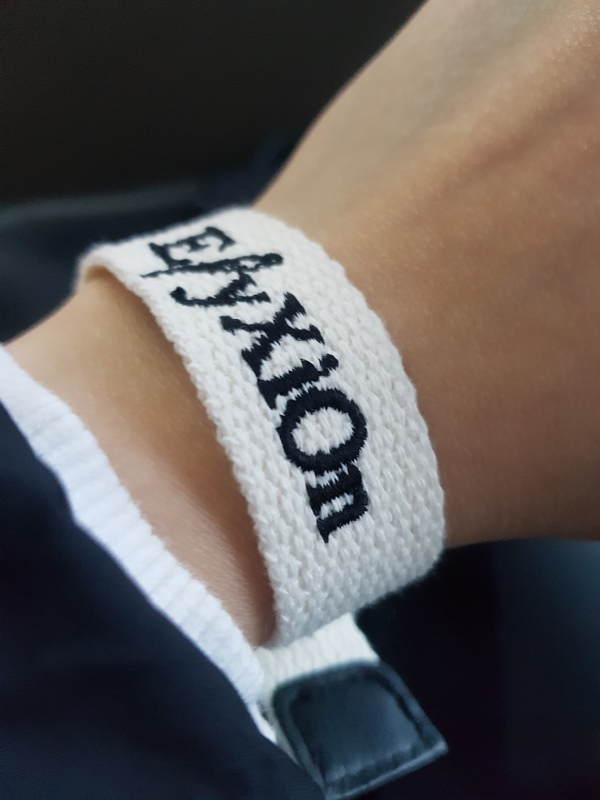 This is also where they give out freebies for all tour participants – for the ElyXiOn it was a canvas textured wraparound bracelet. Next we were whisked off to SM C&C Building for the SUM Market visit where oh joy! my dreams were realised. We got the chance to visit *that* practice room and take a picture! While it was all very perfunctory and you get shepherded into the room and out of it like a factory production line, I was thrilled to step foot into the practice room of my dreams. It would be heaps more fun if SM either played EXO’s hit songs in the background while we waited to take pictures or actually allowed fans to dance to the latest song – small touches go a long way to add so much more to the experience and it wouldn’t take more than an additional 5 minutes to make us fans happier than we already were. 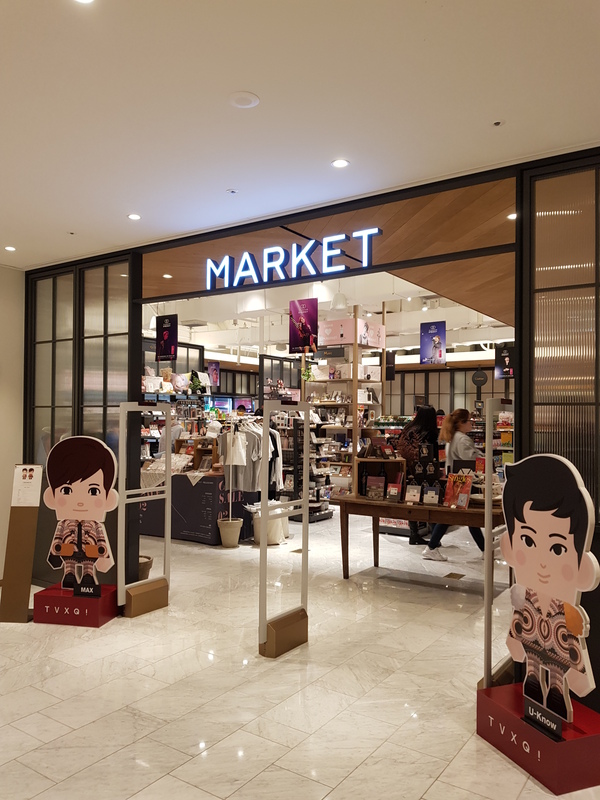 You do get about 15 minutes to look around SUM Market and drop more of your money on your favourite group’s merchandise if you’re so inclined. After that really quick picture taking session and browse at SUM Market, it was back on the bus for us and we were off to lunch at SM’s restaurant SMT Seoul in nearby Cheongdam-dong. 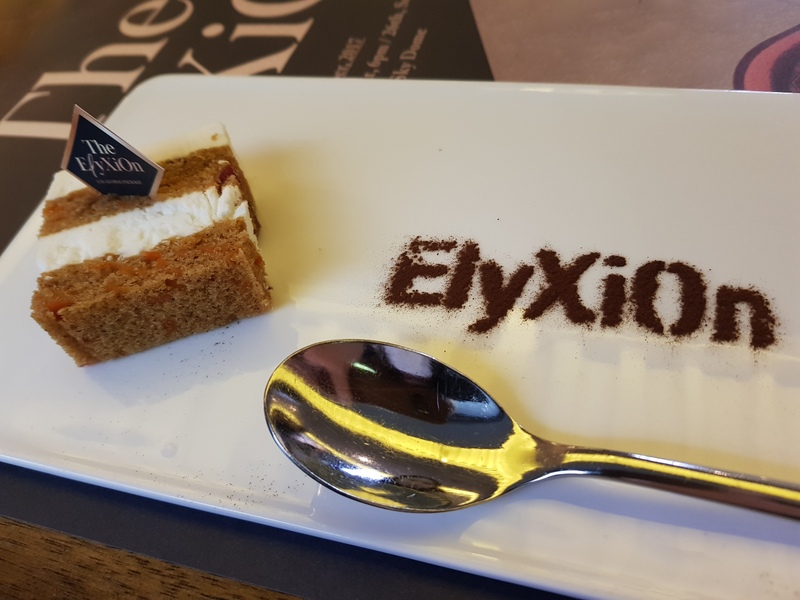 Again, the concert or tour package branding is evident in the use of concert posters as placemats and the ElyXiOn themed dessert. 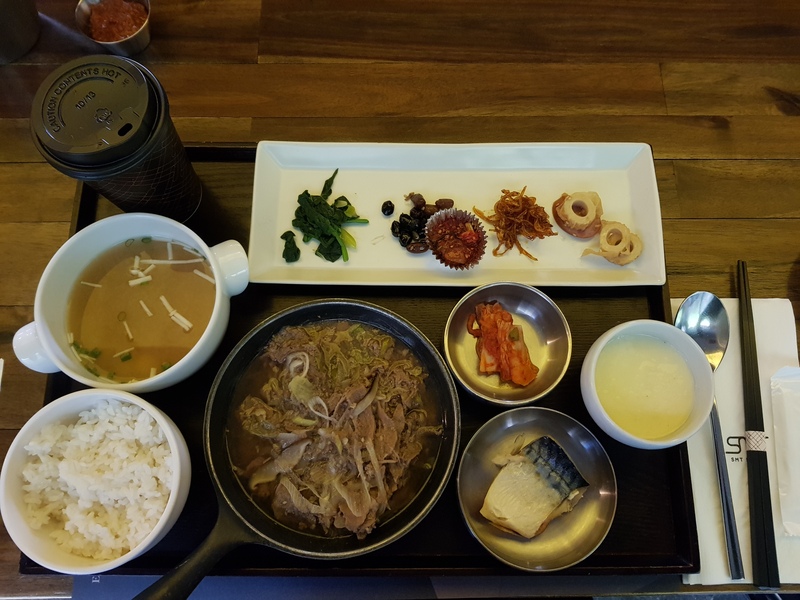 While I have nothing to add on the presentation of the food, I can only hope that the kitchen was having an off day because the taste sure was not representative of what I would’ve expected of a restaurant with SM’s name on it. 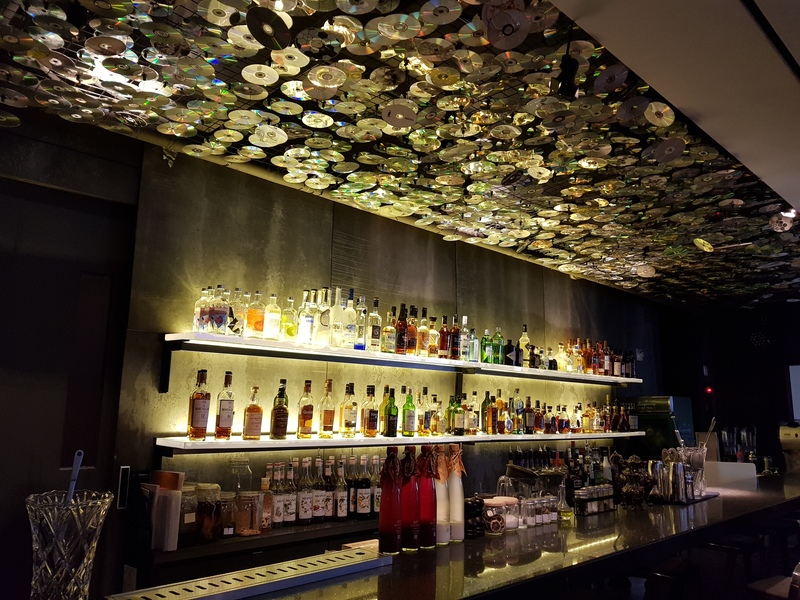 They do have this really cool bar and DJ-ing space on the upper floor so do check it out if you can. 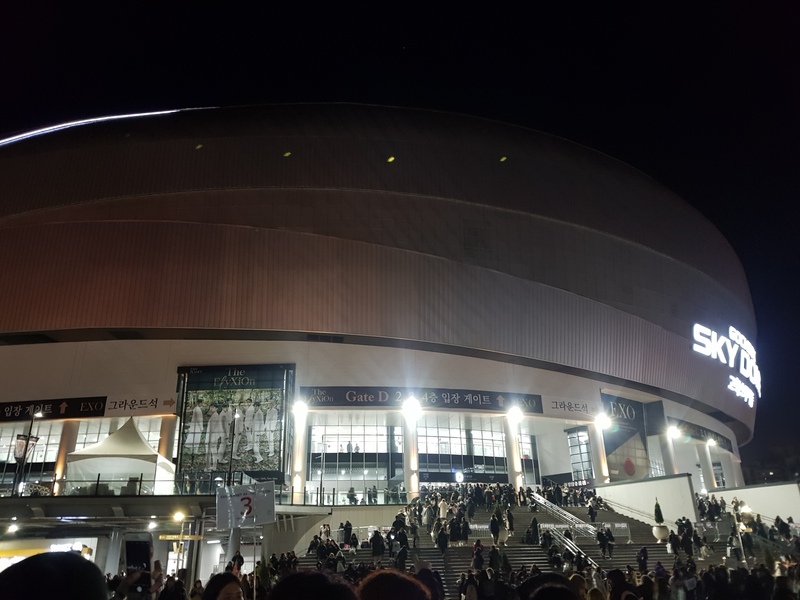 Getting to the concert was pretty much the same as my previous experience but this time around the weekday traffic meant that we were later than usual and put an end to any chances of going around to look for fan site masters. Gocheok Sky Dome was definitely smaller than the Jamsil Olympic Stadium but it made for a closer experience with the boys. As usual, the sound and visual of any EXO concert in Korea cannot be described – you have to be there to feel it! 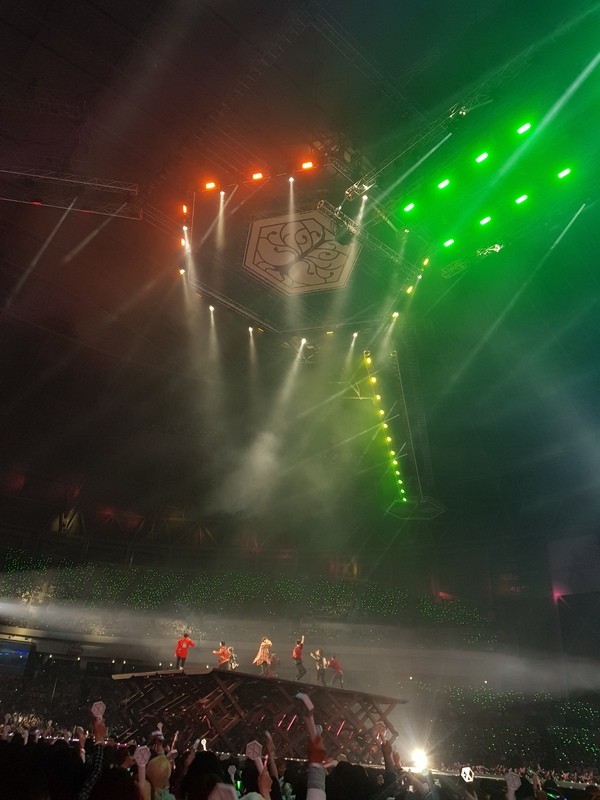 Shim Jaewon and his team really know how to put on a lights and sound show and the clever use of props for the ElyXiOn gave me the feeling that musicals really influenced the production team this time around. If you’re a foreign fan who’s still thinking about experiencing a concert in Korea, for me taking up a SMTOWN Travel package is one of the easiest ways of doing so, especially if language in a foreign city is a barrier. You’ll also get to hang out with like minded fans from all over the world in your group so be friendly and strike up a conversation – we’re all here for the same purpose anyway so don’t be shy, I won’t bite. Heh. 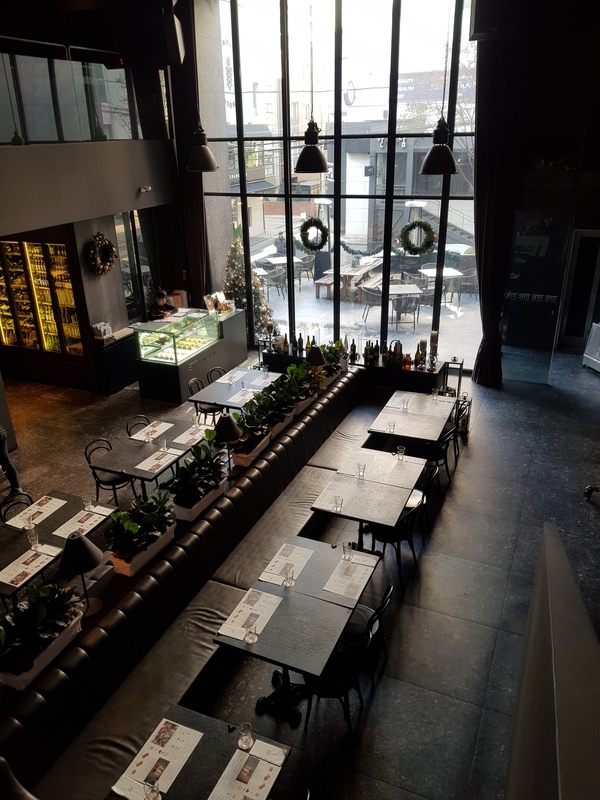 Do you really need a Premium package to enjoy yourself? Heck no. I had a good time previously on the Economy package because really, I’m here to see the boys do their best and have fun on the stage. At the end of the day, it’s about what will give you the most happiness. So, until we meet again at the next concert…! Great and informative btw! I’m curious on whether they do Global Packages for Encore concerts? I’m hoping they’ll have another concert soon so I can attend but I wanted to know if GP for that type is a thing (?) if that makes sense? Ahah thank you! Hello Narnia, glad to know you found the write up informative. By encore concerts I’m assuming you’re referring to the Dot concerts? If yes, then SM TOWN does run Global Packages for the Dot concerts. In fact, my first experience with the Global Package is for the EXO’rDIUMdot and I’ve also written about it on the blog. Hello Narnia, you can refer to the page that I’ve written on Fan Guide to Global Package as I do put some references to prices there. Cheers. Hi Baekana, I am assuming that your mother would only accompany you during the stay at the hotel and not for any of the listed events or concert. If so, by right hotel rooms only allow the same number of persons who are booked to stay. So if you take a single package for one person but have two people staying in the same hotel room and the hotel finds out about it, then the hotel is within their rights to charge you extra for the additional person at their own rates. If you take up a twin package, please note that you cannot sell or give away the extra concert ticket in your mother’s name to anyone else – if SMTOWN Travel finds out, you can be denied entry to the concert and possibly blacklisted from future events. Hi Valerie, the definition of better seat is quite subjective. 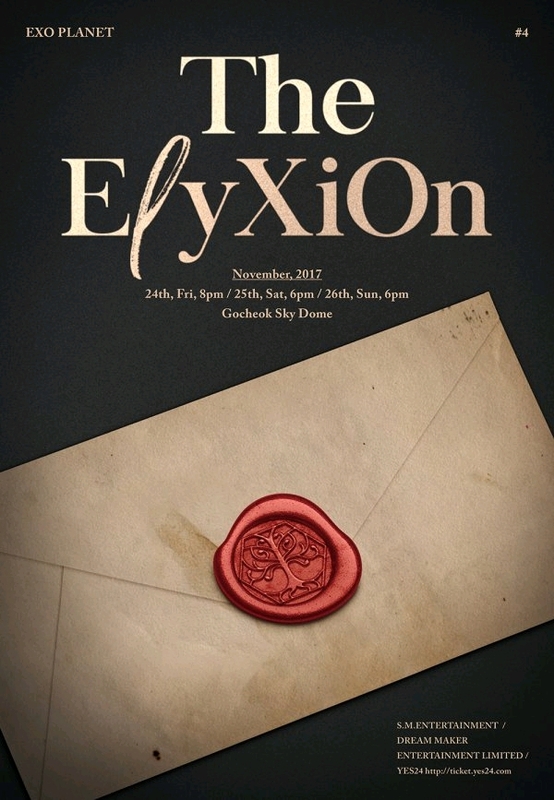 As ElyXiOndot is at Gocheok Skydome which is the same venue as ElyXiOn last November, I am assuming that the layout will be pretty much the same. So, premium package participants should likely get the seats at the sections near the front/main stage. Economy package participants should likely be towards the secondary/extended stages. 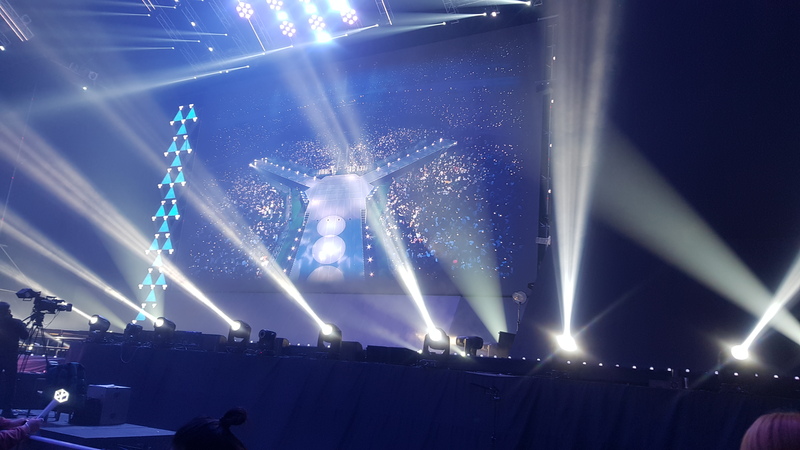 If you’re on the small side, you may have a slight problem to view what is happening on the stage as the ground is flat and the stage is raised (about chest height). Hope you have fun at the encore concerts! Hi, I was wondering what the pre-order merchandise was? Was a light stick included or did you have to buy one yourself? Hi Erin, the pre-order merchandise for ElyXiOn in Seoul did not include lightsticks. This may be because I understand that SM has stopped producing version 2 of the lightstick. For ElyXiOn in Japan fans were given the opportunity to pre-order the Japan design lightstick but I did not purchase this as I already had my own official lightstick. Hi Erin, if you’re looking for the lightstick the upcoming ElyXiOn in Manila has the lightstick available for pre-order. Hope this helps. my sister and I want to book elyxion tickets for Hong Kong over smtown global. I just want to know if the tickets are standing or seating tickets? Did you had a nice view? Hi Antonia, for ElyXiOn in Hong Kong I see from the seating map that they have standing area/mosh pit as well as seated tickets. I believe that if you take up a Global Package with SMTOWN for Hong Kong you will get seat tickets which will be further away from the main stage but maybe near to the extended ‘wings’ of the stage. This layout is different from the Korean concerts where all tickets are seating only, no standing area. So, you will have to consider if you feel this is something you can live with.